Today I am going over one of my favorite things and that is cooking with cast iron. We are going to go over the aspects of primitive outdoor cooking using cast iron. If you’ve been curious or timid about cooking with cast iron and how to use this pioneering method of cooking, then you my friend are in for a treat. 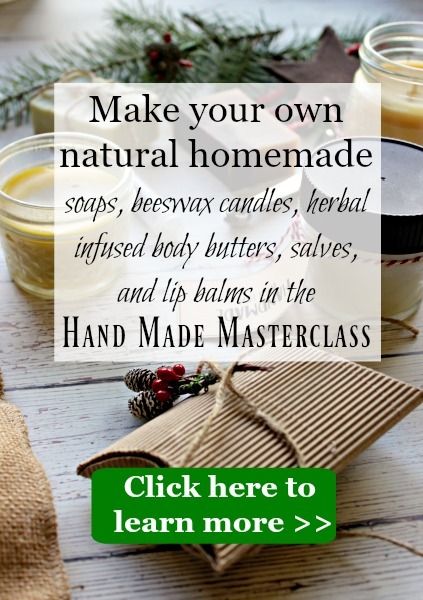 I’ve brought on Tracy Apperson, a wilderness guide and mentor and owner of Sparrow Rose Soap & Herbs. She admins several bushcraft & homesteading related groups, including Indiana Bushcrafters and Bushcraft LIVE. 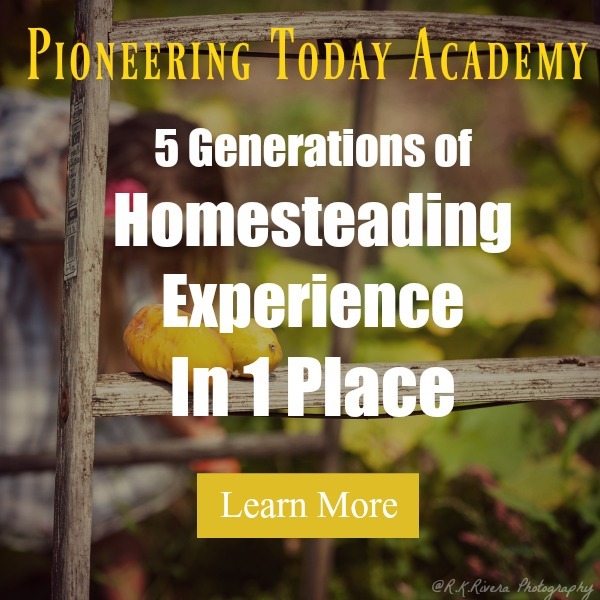 Tracy is one of the guest teachers within the Pioneering Today Academy and she does a lot of outdoor cast iron cooking. She actually has some tools including a piece of cast iron that has been in her husband’s family for five generations. 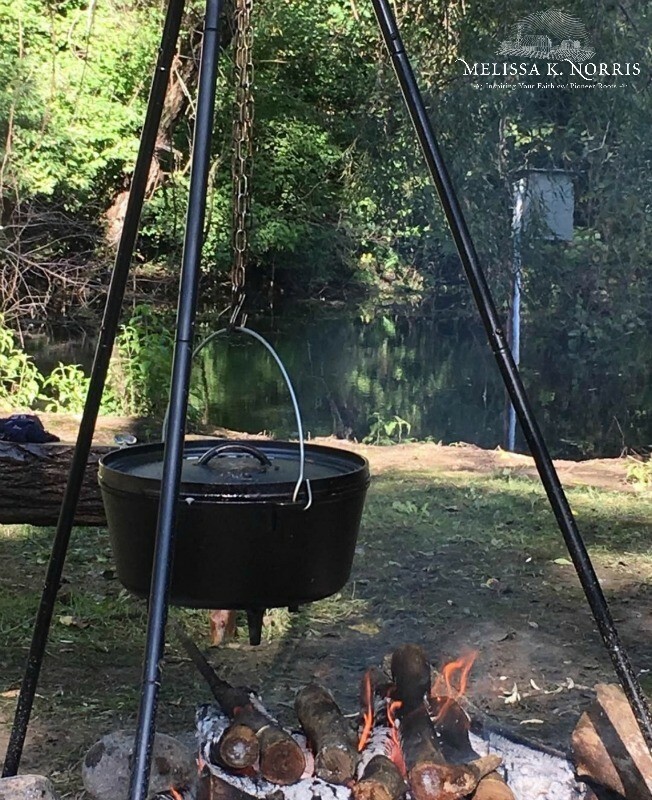 Listen below to, Cast Iron Dutch Oven Outdoor Campfire Cooking, Episode #156 of the Pioneering Today Podcast, where we teach families how to grow, preserve and cook their own food using old-fashioned skill sets and wisdom to create a natural self-sufficient home, with, or without, the homestead. The doors to the Academy will be open for enrollment this Monday September 24th, if you’re not on our notify list, click here and get yourself on it!! What is the versatility of cast iron? Tracy: There is a ton of versatility when cooking with cast iron. It’s easy to take care of and you don’t get the hot spots when you’re cooking over a fire like when you’re using lighter weight materials and end up burning your food. 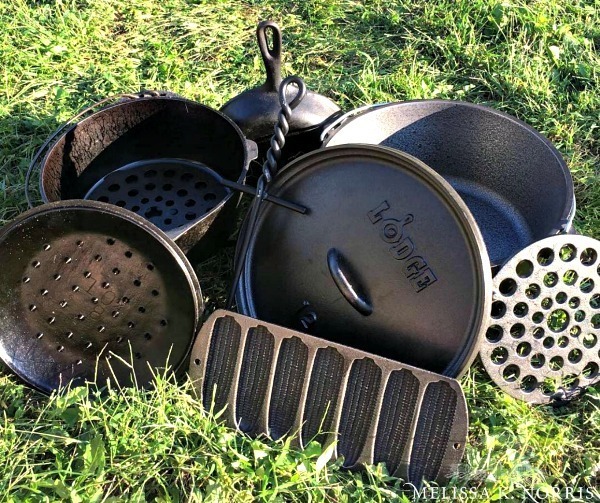 You can use Dutch ovens, drip drop roasters, a huge variety of skillets, trivets, lid lifters. 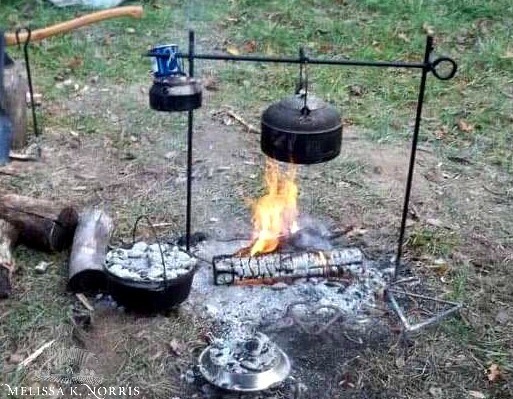 There are also fire irons that can be used as a tripod and you can hang things over the fire. 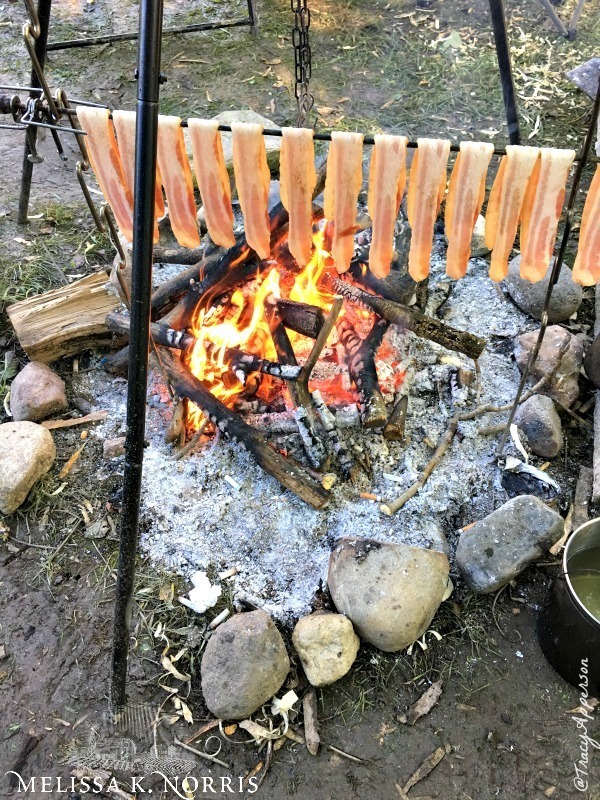 For example, cooking with bacon, you can put it on a grate and use skillets or you can hang the bacon directly on the crossbar of the tripod. Clean up is also really easy in the field. Melissa: I love the simplicity of it. You can use it and do so many different things with it, from stove top, to outside, to in the oven. I feel like it’s actually simplified down my kitchen just in the amount of stuff that I have to keep stock so that it’s more clutter free and basic without having the need to have all of those other things. We loose power a lot and we’re kind of last priority as far as restoring power because there’s not as many customers. But I’ve been in the middle of mixing up biscuit dough and then the power goes out. We can just go and start up the Dutch oven and it doesn’t affect our food prep. I can still do all of my baking and all of my normal cooking that I would do with our regular electric oven, and I can do it outside or on the wood stove. Also, when it’s hot out (as long as there’s not a full fire ban on, if you have an approved fire pit) then you can still cook in that. So even during the summer to help keep the house cool, I’ll use the cast iron and cook outside, as well as cast iron dutch oven camping trips. 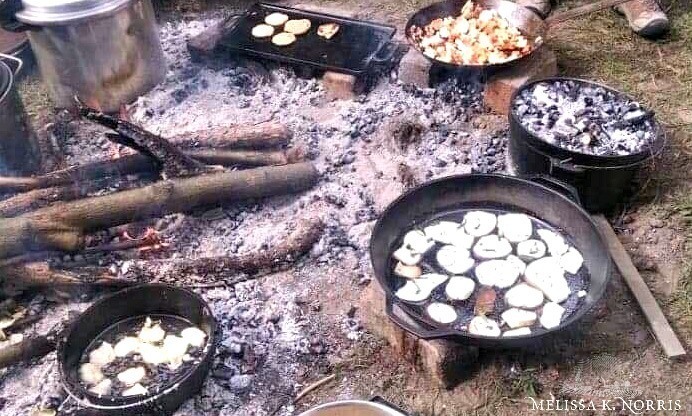 Get access to our Cast Iron & Dutch Oven Outdoor Cooking e-course inside the Pioneering Today Academy when the doors open this Monday, get on the notify list now! How to take care of and season your cast iron. Tracy: The seasoning that is on your cast iron is an accumulation of oil that has cooked onto the cast iron itself. This oil provides a protective service against rust. It also helps make it nonstick and more easy to care for. If you use a soap that dissolves the oil, you are damaging your seasoning. When finished cooking use a plastic scraper to get any residue off, if there’s nothing that’s stuck on, then it’s easy to just to wipe it out with a paper towel or a lint free cloth and then just put some oil on it. Some people might think that’s kind of gross, but when you heat it back up, you’re sterilizing it anyway. If you do remove the seasoning, you’ll have to re-season it, so you want to avoid that because it is a lot of work. You also run the risk of having it rust and other issues like sticking and things like that. If I wanted to use soap, I would use something that wouldn’t remove grease, like a really mild castile soap, and do that extremely sparingly and only if really needed. 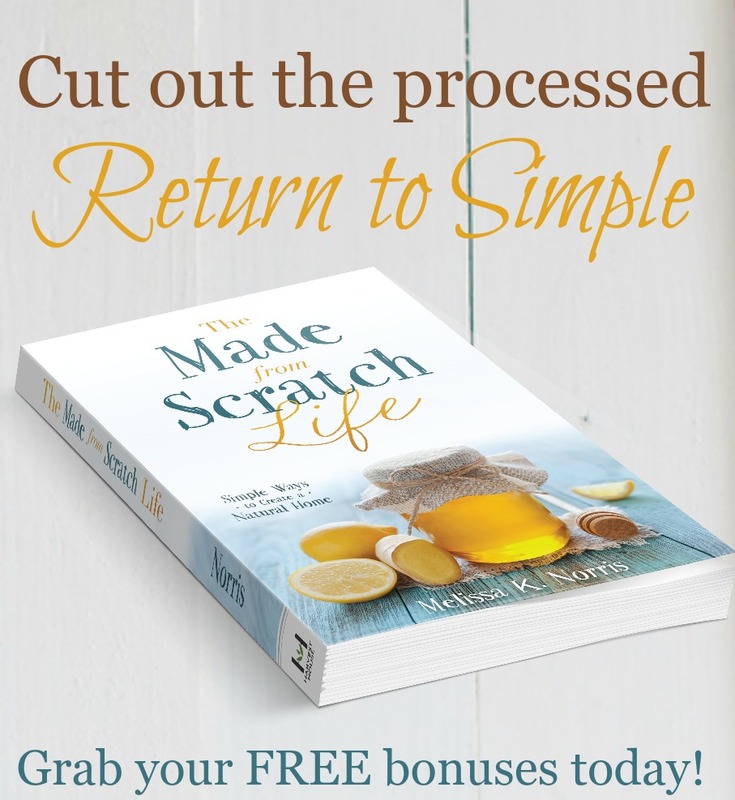 Another easy way to get things that are stuck on is while it’s still hot, I add a little bit of warm water or a little bit of course salt, and you sort of rub that around in the coarse salt. Or if you’re in the woods, you can even use some sand. I’ve seen a lot of people use chainmail kind of scrubbies on there, but I don’t recommend them, but steel wool seems to be fine. You just don’t want to damage the seasoning on there because it’s somewhat labor intensive to fully re-season cast iron. So it’s best to just not damage the seasoning in the first place. Melissa: Exactly. I will run my tap water really, really hot and then use that really hot water and rinse it out. Otherwise, I’ve got a brush so I’ll use a little scrub brush without soap or I’ll use salt, and that works really well too. I don’t really ever have to use the soap. If you use the soap very often, you’re constantly re-seasoning it. People say “I want a really nonstick pan.” Well, if you’re taking care of your cast iron properly with the methods that we’ve been discussing, then you are going to be building up your seasoning without having to totally strip it, and avoid doing an in depth re-seasoning every time you use it. Don’t get the fire too hot. It’s best to let the fire get hot and then let it burn down so what you have left is primarily coals. Have a separate keyhole fire so you can have coals that stay ready off to the side of the area that you’re actually cooking. This allows you to add fresh coals and keep on baking. Use a Dutch oven with the flanged lid (the flat lid that has the lip around it). This allows you to put coals on top so that you get more even baking without burning what’s on the bottom. 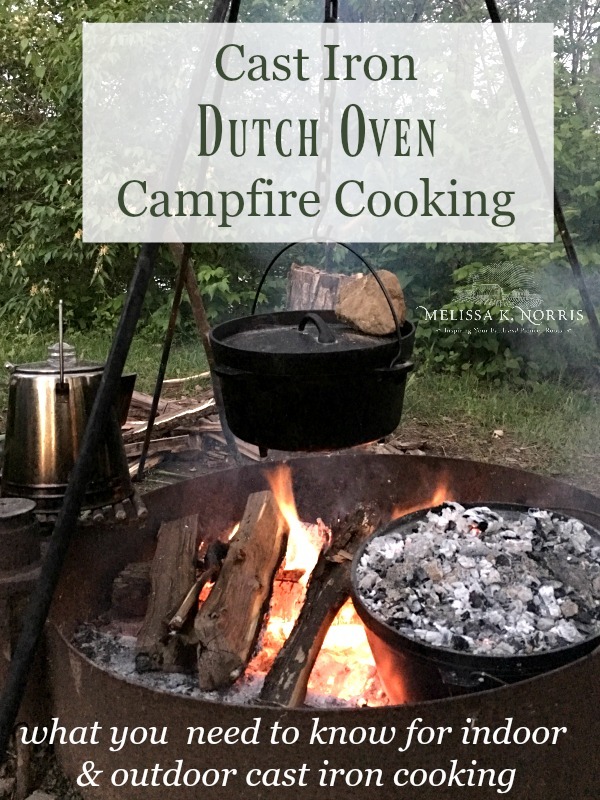 Keep the Dutch oven level while cooking using wood or rock (not river rock). If you need to wash it in the field (because they do cling to soot) use a little bit of castle soap to wipe it down. Then dry well and re-oil so that it doesn’t rust. Make sure it’s dry before you store it so it doesn’t rust and re-oil it. An easy way to make sure that it’s dried completely is after you rinse it out and wipe it down with a lint free cloth, then just set it back on the heat for a minute. Re-oil to prevent your pans from rusting. Just rub a little oil on it and it’s ready to go for next time. When baking in a Dutch oven, you need to use coals or embers. You need to have more on top of the lid than underneath so you have even heating and you’re not burning the bottom while the top isn’t getting done. For example, when I’m using six or eight quart, I might have the equivalent of maybe six briquette size pieces underneath and maybe a dozen on top. Try to be aware of where the heat is (the embers glowing) and every 15 minutes the oven about a quarter turn so that you’re keeping the heat more even. That way, you don’t have any spots that are getting done before the other. 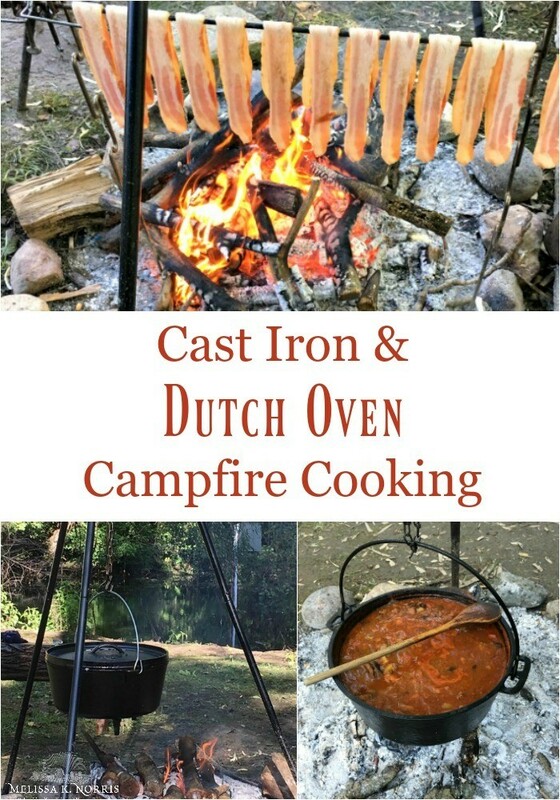 What are some must need accessories for Dutch oven campfire cooking? Lid lifter is essential. Just having a hot pad, would be doable, but having that lid lifter, it’s not very expensive, is so worth it. Long heavy duty pair of tongs. These are great to range the coals and rearrange the coals. 10 in cast iron skillet. I make everything from cinnamon rolls, to biscuits in it and it tastes so much better. This is my go to with my cast iron cooking. Spider Dutch oven ( 5 or 8 quarts) with the flange lid are great because the legs on the bottom of the Dutch oven allow it to straddle the coals and stay stable. 4 in 1 Dutch oven tool. It can be used as a lid stand, or a lid lifter, or a cook stand, a trivet, a veil lifter. It folds up, it’s small. Long handled spoon or a spatula (about 22 inches long) are handy for not burning your arm hair over the fire. Wood is better so the metal ones don’t heat up and burn you. Thick leather gloves or welding gloves because your cast iron will get really hot. Melissa: Okay, so talk to me about the tripod, how you use that the most, and what you would be looking for if you’re looking to purchase one or have one made. Walk me through that because that’s not a piece that I have, but it’s one that I’m highly interested in getting. So I kind of want to pick your brain. This is for me right now. Tracy: The set that we have is actually a set of fire irons that was made by a blacksmith that is no longer making items. But it’s three pieces, and you can hook them together at the top to form a tripod, which then you can hang things from either by that four in one thing, or by a chain, or you can set them up so that it’s two uprights and a bar that goes across. And then you can hang things from that, which is really nice if you’re going to hang more than one item on that. Melissa: Do you use that more when you’re simmering or roasting? Do you use that when you’re doing baking? How do you pick when you’re going to be using the tripod versus just putting nestling the pot down in the coals? Tracy: For baking, it’s much better to put it in the coals because you do need to put coals on top or you won’t get an even bake. But if I were going to hang something, that would be real common for things like soups, stews, chili, things that don’t need to be directly on the fire to bake. It’s also good for keeping things warm and not burning it on the fire. There’s a piece called a trammel that’s like a hook that helps to adjust the height of the chain so you can adjust the cast iron according to the height of the flame or the coal. With fire irons or a tripod, taller is better because it gives you more versatility. You can always lower it, but you can only raise it as high as the height of your tripod. And get something sturdy because if you’ve got a heavy empty Dutch oven, and then when you fill them, they’re going to be even heavier. The last thing you want to do is to have the thing collapse on you. It’s also handy because you don’t need a grate. It’s easier to add stuff to the fire without having to move the grate or move the pots to put the fuel on and then put them back down because you could just adjust it. 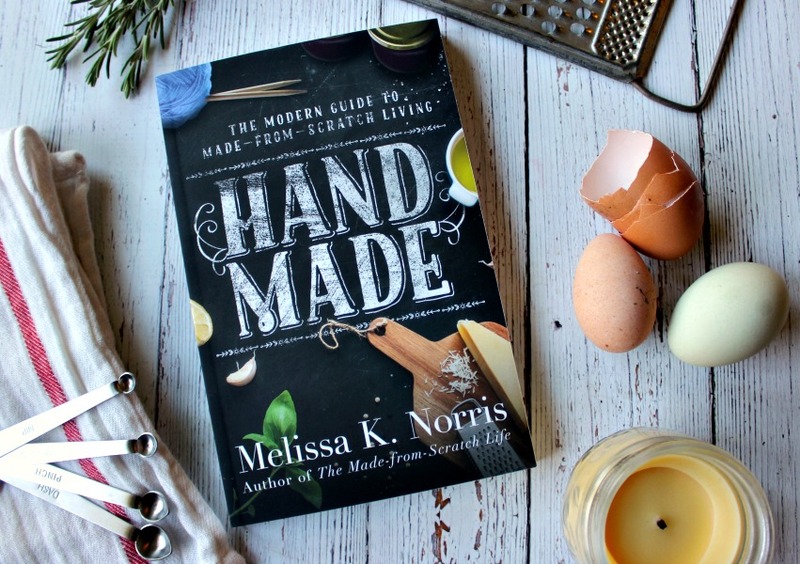 Melissa: There is a special element when you do prepare it outside over that open fire. I don’t know if it’s possible for it to taste any different, but I swear food tastes better in a cast iron, and it tastes better when you’ve cooked it outdoors too. Tracey, thank you so much for coming on today. 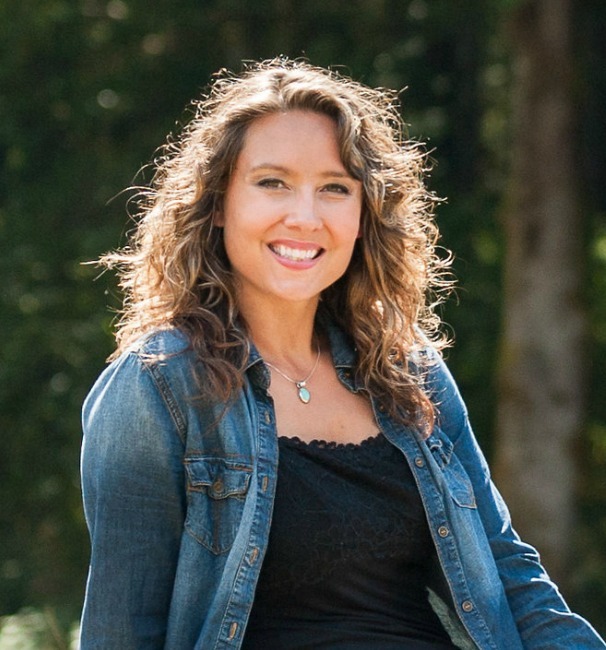 I am so thrilled that you’re going to be a guest teacher for us, and I can’t wait to dive into those lessons on using a cast iron Dutch oven over an open wood campfire.